DC has a favorite bookstore. I mean a very favorite bookstore! 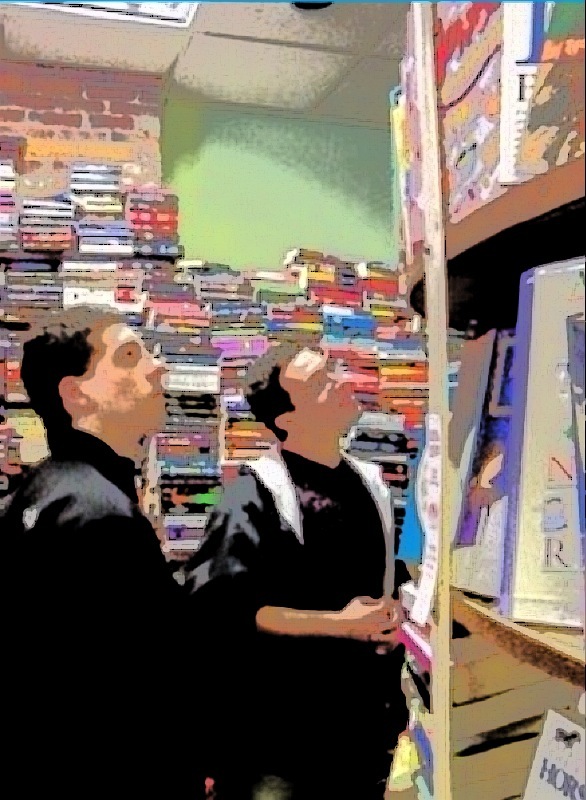 It is located in Salem, MA and everytime we visit there – which is quite often, that store must always be one of our first stops. We are spending this weekend in Boston and decided to take a side trip into Salem. 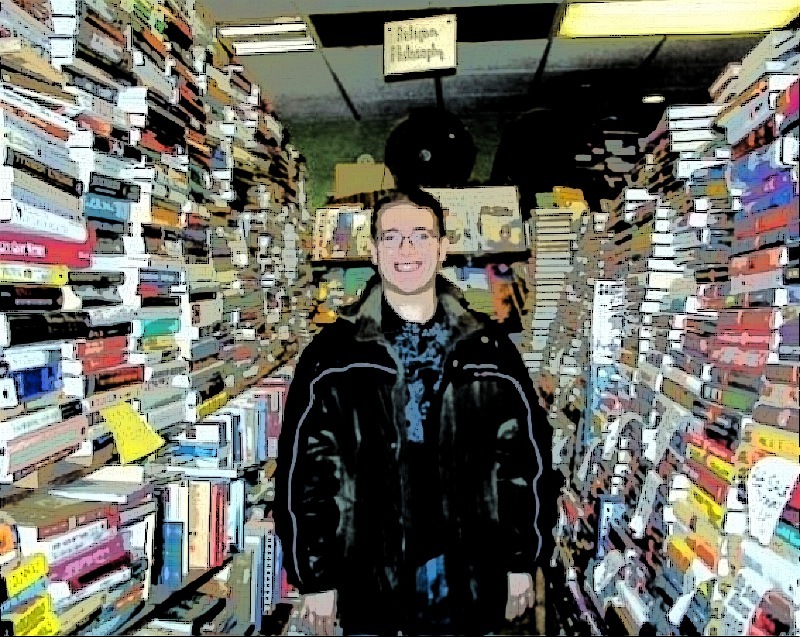 DC was excited to go to his favorite book store. 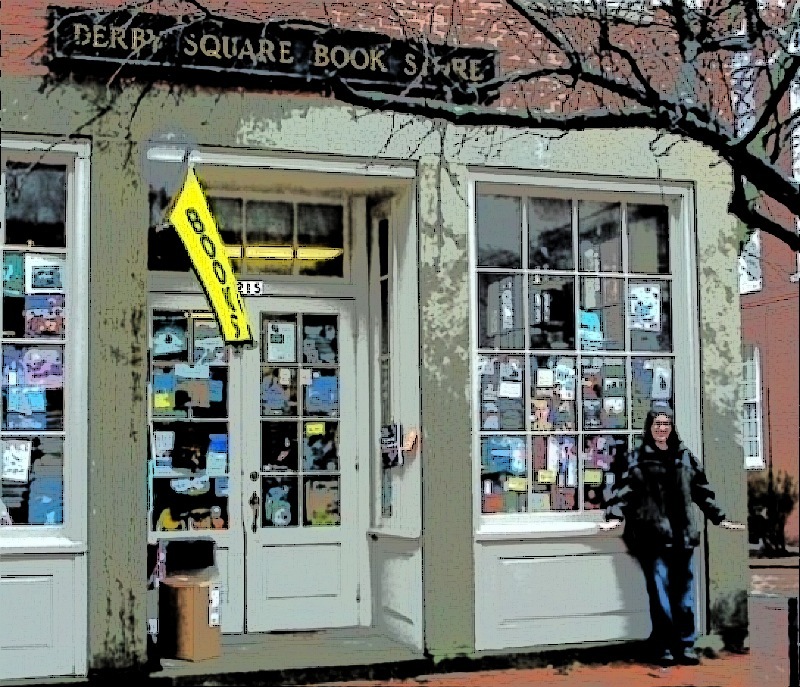 Let me tell you, this place, The Derby Square BookStore has books piled up everywhere. It was always frightening for me. 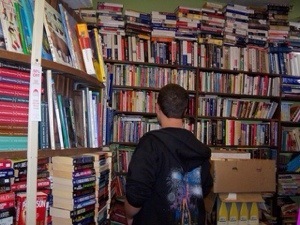 I am always afraid that if he moved just one book the wrong way, everything would come tumbling down on us. But he just loved it! He loved it so much that his cousin drew a picture of him in the store for Christmas one year. On our way to Salem today, I said to Doug, and I don’t know why, “Someday we are going to show up at this store and find it gone”. 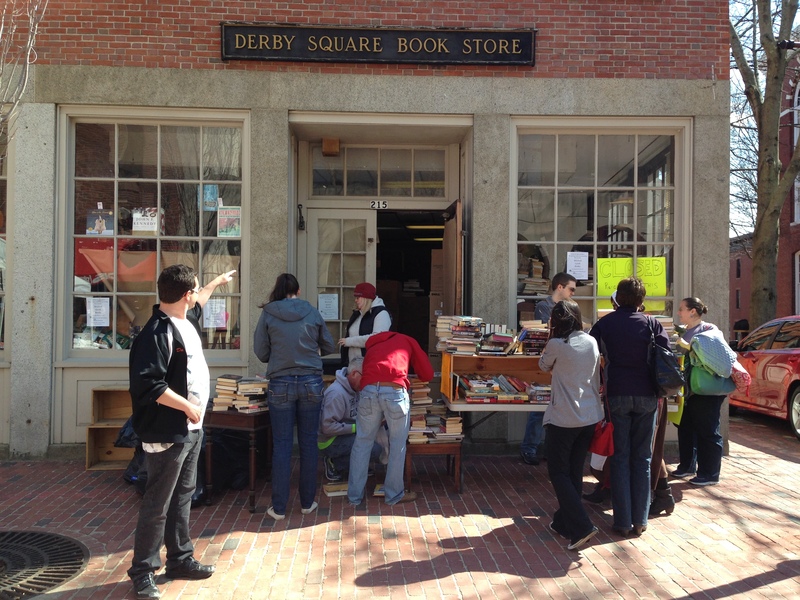 We arrived at the store and found a table outside with some books on it, the door blocked by the table, a few people looking at the books outside and a sign that said “Closed! Reopening in June”. DC would not understand this. He couldn’t understand why he couldn’t go in. I tried to have him look at all of the books on the table hoping he would find just ONE that he was interested in – but he did not. The new owner saw how upset he was getting. We didn’t have to say anything to her or ask; she shuffled DC and I inside and let him look around. We had to be careful as everything was being boxed up, but honestly we really didn’t have to be any more careful than we always had to be in there. There wasn’t much that was not already in boxes but he managed to find 3 books. “Phew, put hand to face” as DC would say. 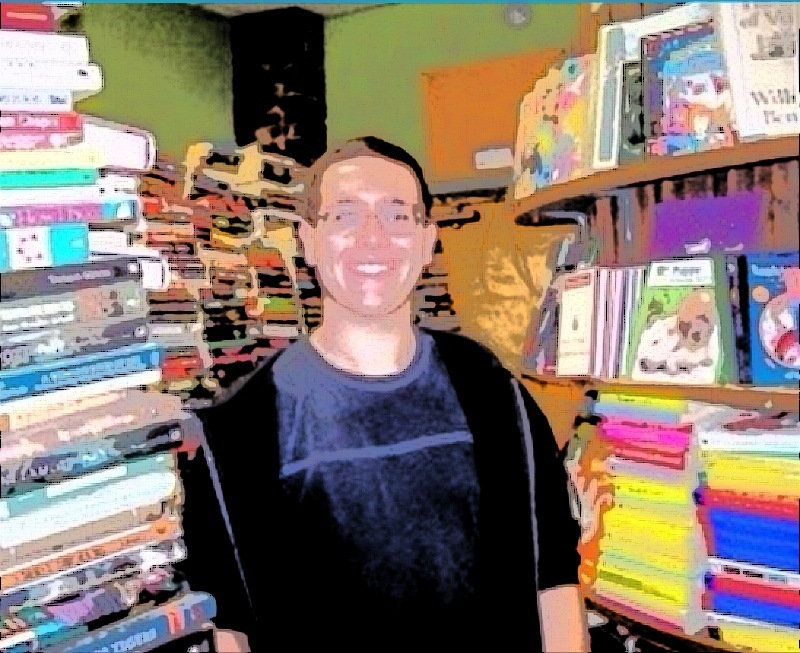 As I was paying her for his books and thanking her profusely, she told me that she had just purchased the store and that it was going to take a while for her to go through everything, get it all in some sort of reasonable order, and renovate the inside so it didn’t give the impression of the walls caving in on you. I can’t picture this, but I can’t wait to see it. I thanked her again. DC thanked her as well. It was such a nice thing for her to do! She has no idea how she single-handedly saved the rest of the day for us! I didn’t get to go into that kind of detail with her because she was busy with other customers. I wish I could have. Now all I have to do is be sure we do not make any trips to Salem until after June! Bill: It’s that 6 letter word that creates the greatest fear…..change! Thanks to her for realizing the importance of a simple act of kindness! I think that was awesome of her and when these little acts of kindness happen……we remember!